Lipids are the most abundant organic compounds found in the brain, accounting for up to 50% of its dry weight. The brain lipidome includes several thousands of distinct biochemical structures whose expression may greatly vary according to age, gender, brain region, cell type, as well as subcellular localization. In synaptic membranes, brain lipids specifically interact with neurotransmitter receptors and control their activity. Moreover, brain lipids play a key role in the generation and neurotoxicity of amyloidogenic proteins involved in the pathophysiology of neurological diseases. The aim of this book is to provide for the first time a comprehensive overview of brain lipid structures, and to explain the roles of these lipids in synaptic function, and in neurodegenerative diseases, including Alzheimer’s, Creutzfeldt-Jakob’s and Parkinson’s. 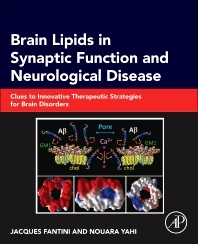 To conclude the book, the authors present new ideas that can drive innovative therapeutic strategies based on the knowledge of the role of lipids in brain disorders. 1.4. Solubility in water: what is it? 2.3. Lipid self-assembly, a water-driven process? 2.4. Lipid–lipid interactions: why such a high specificity? 3.8. Key experiment: Alzheimer’s disease, cholesterol, and statins: where is the link? 5.1. The synapse: a tripartite entity? 7.7. Key experiment: transfection of membrane receptors: what about lipids? 9.5. Conclusion of the investigation: who is guilty, who is innocent? 10.10. Conclusion of the investigation: who is guilty, who is innocent? 11.4. Amyloid pores: β, α, or both? 11.10. Key experiment: a blood-based test to predict Alzheimer’s disease? 12.4. Key experiment: what is a virus receptor? 13.1. Why do we need a unifying theory? 13.5. Why two lipid receptors are better than one? 14.7. Could anti-HIV drugs also be considered for the treatment of neurodegenerative diseases? Nouara Yahi was born in France in 1964. She has accumulated 25 years of fundamental research and teaching experience in virology and molecular biology areas. She has been a pioneer in the analysis of resistance mutations in patients with HIV infections, and has published several important articles in this field. She is currently professor of biochemistry at Aix-Marseille University and leader of the research group ‘Molecular Interactions in Model and Biological Membrane Systems’. This group is internationally recognized for studies of lipid-lipid and lipid-protein interactions pertaining to virus fusion, amyloid aggregation, oligomerization and pore formation. Together with her teammate Jacques Fantini, Nouara Yahi has discovered the universal sphingolipid-binding domain (SBD) in proteins with no sequence homology but sharing common structural features mediating sphingolipid recognition. The SBD is present in a broad range of infectious and amyloid proteins, revealing common mechanisms of pathogenesis in viral and bacterial brain infections, and in neurodegenerative diseases. Nouara Yahi is the author/co-author of 90 articles (PubMed), with 4400 citations and a H-index of 40. She has also published 5 patent applications.